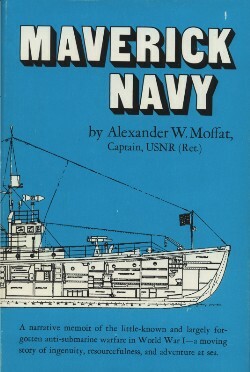 Moffat, Alexander W., Maverick Navy. Wesleyan University Press, Middlewown, Conn. 1976. Moffat was commander of SC 143, operating from the subchaser base in Plymouth, England. Compared to the books by Nutting (Cinderellas of the Fleet) and Millholland (The Splinter Fleet of the Otranto Barrage), this is less of an action-adventure, although it does contain the requisite (and admittedly unproven) claim of sinking a sub. What is most remarkable about this story is its portrayal of the utter lack of readiness of the commander and crew, their numerous brushes with death due to their lack of navigation skills or experience at sea, and the lucky breaks that kept most of the crew alive. The picture that emerges is that of a highly improvisational tour of duty. I found this book a bit harder to become engrossed in than Nutting or Millholland, possibly in part because Moffat portrays himself as more arrogant and less likeable than the rather more colorful portrayals of the commanders in the other books. On the other hand, this story includes a lot of anecdotal and gritty detail about life aboard these small vessels that makes it worth reading. It is readily available from used book sellers online for $10 to $15.